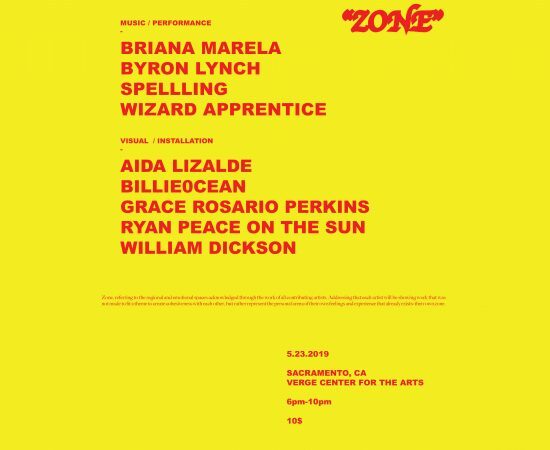 Zone is a community exhibition curated by Ryan Peace On The Sun and hosted by Verge. Zone, referring to the regional and emotional spaces acknowledged throughout the work of all contributing artists. Addressing that each artist will be showing work that was not made to fit a theme to create cohesiveness with each other, but rather represent the personal arena of their own feelings and experience that already exists- their own zone. Curated by Ryan Peace On The Sun, a Sacramento born multimedia artist and musician whose 2-D work consists on vibrant and energetic scenes of reflection made with a combination of drawing, pointillism, painting, and xerox copies.